1. 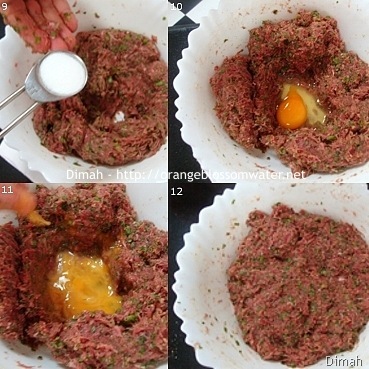 Put ground meat in a bowl. 2,3. Using coarse grater, grate onion. 4. Hold a sieve above the ground meat and put grated onion and squeeze so you get the juice only, then discard the shredded onion. 5. Finely chop parsley leaves. 6. 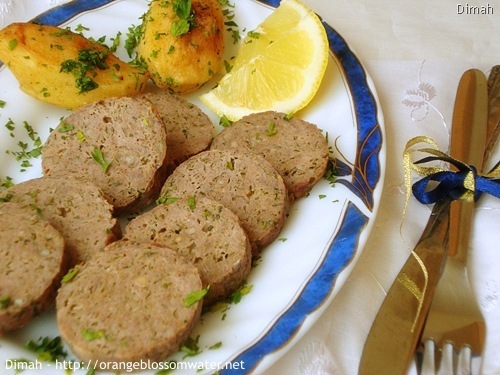 Transfer chopped parsley to the bowl that contains ground meat. 10. Make a well in the center, and add egg. 11, 12. Mix all the ingredients until well combined. 13. Prepare a white clean cotton cloth. 14. Dust the cloth with flour. 15, 16. Roll the mixture into log, I got three logs. 17. Wrap the log in the cloth, and tie with strings and twist the ends together and tie with the strings. 18. Fill a pot with water, and add onion quarters, whole nutmeg, salt and black peppercorn, bring this water to boil. 19. 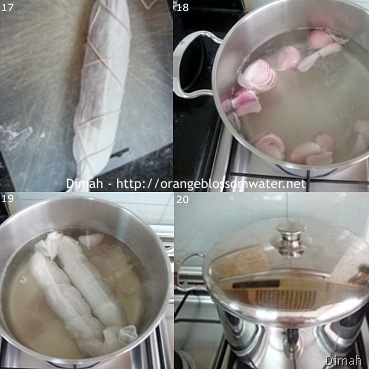 Once water is boiling vigorously, add the wrapped logs, the water should cover the logs. 20. Cover the pot, and cook on medium-low heat for one and a half hours to two hours, but make sure during this time to check every once in a while and if you noticed that the water level is decreased, you have to boil extra water and add it to the pot, you have to keep the logs covered with water all the time. 21. After one and a half hours to two hours, it should be cooked so turn off heat and drain. 22, 23. Unwrap the logs. 24. Let them cool then slice and serve cold. 25. Choose small potatoes, and peel the potatoes. 26. Fill a pot with water and salt, add potatoes, and boil for 7 – 10 minutes, what we did is called parboil (to cook partially by boiling for a brief period). 27. Drain the potatoes, and allow to sit for a moment to dry out. 28. In a pan, heat butter and corn oil. 29. Add potatoes and sprinkle with a dash of salt and black pepper, remember to stir/toss throughout to prevent the potatoes from sticking to the pan. Half way through the cooking, turn them over. You know when to turn them over when they are light golden. 30. When both sides are light golden remove from pan and transfer to a baking dish. 31. To the potatoes, add the butter corn oil mixture that remained in the pan. 32. 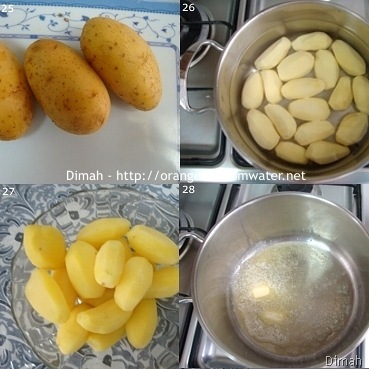 Cover the potatoes with aluminum foil, and cook in the oven at 302 °F (150 °C ) for 10 minutes, then remove the foil and cook for 5 minutes more, just until potatoes become golden from all sides. 33. 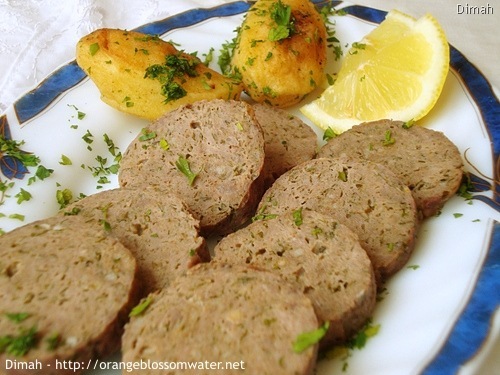 Garnish with chopped parsley leaves, and serve Jilantin Al-Lahem cold with sautéed potatoes, Arabic flat bread and lemon wedges. Put ground meat in a bowl. Using coarse grated, grate onion. 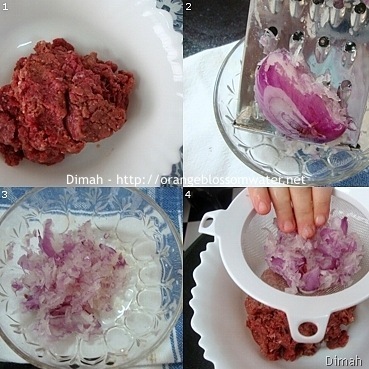 Hold a sieve above the ground meat and put grated onion and squeeze so you get the juice only, then discard the grated onion. 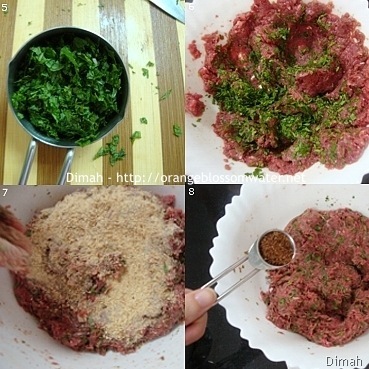 Transfer chopped parsley to the bowl that contains ground meat. Make a well in the center, and add egg. Mix all the ingredients until well combined. Prepare a white clean cotton cloth. Dust the cloth with flour. Roll the mixture into log, I got three logs. Wrap the log in the cloth, and tie with strings and twist the ends together and tie with the strings. Fill a pot with water, and add onion quarters, whole nutmeg, salt, and black peppercorn, bring this water to boil. 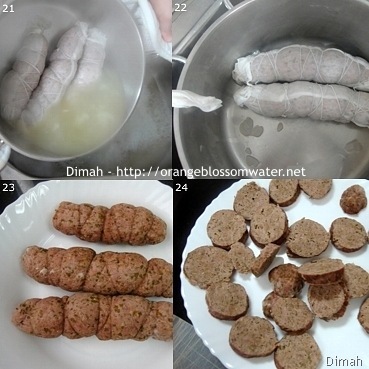 Once water is boiling vigorously, add the wrapped logs, the water should cover the logs. Cover the pot, and cook on medium-low heat for one and a half hours to two hours, but make sure during this time to check every once in a while and if you noticed that the water level is decreased, you have to boil extra water and add it to the pot, you have to keep the logs covered with water all the time. After one and a half hours to two hours, it should be cooked so turn off heat and drain. Let them cool then slice and serve cold. Choose small potatoes, and peel the potatoes. Fill a pot with water and salt, add potatoes, and boil for 7 – 10 minutes, what we did is called parboil (to cook partially by boiling for a brief period). Drain the potatoes, and allow to sit for a moment to dry out. In a pan, heat butter and corn oil. Add potatoes and sprinkle with a dash of salt and black pepper, remember to stir/toss throughout to prevent the potatoes from sticking to the pan. Half way through the cooking, turn them over. You know when to turn them over when they are light golden. When both sides are light golden remove from pan and transfer to a baking dish. To the potatoes, add the butter corn oil mixture that remained in the pan. Cover the potatoes with aluminum foil, and cook in the oven at 302 °F (150 °C ) for 10 minutes, then remove the foil and cook for 5 minutes more, just until potatoes become golden from all sides. Garnish with chopped parsley leaves, and serve Jilantin Al-Lahem cold with sautéed potatoes, Arabic flat bread and lemon wedges. 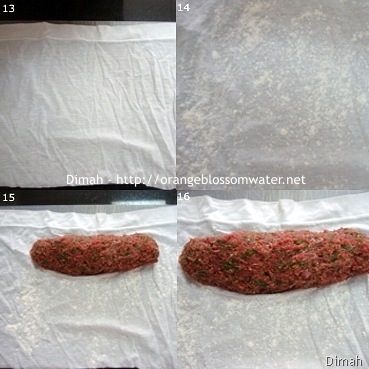 I do not recommend using aluminum foil or plastic wrap instead of the cotton cloth, I did a test and found that the best method for cooking this is to wrap it using the cloth, the foil and the plastic wrap changed the taste and wasn’t tasty. 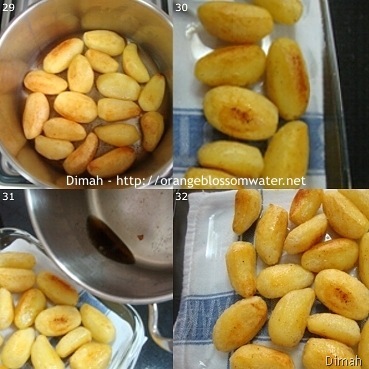 I learned the recipe of sautéed potatoes from a Lebanese chef on TV. I like to sprinkle the sautéed potatoes with cumin. 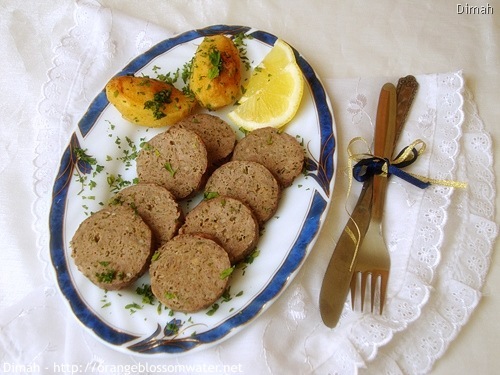 This entry was posted on Saturday, July 31st, 2010 at 1:50 AM	and is filed under Syrian Cooking. You can follow any responses to this entry through the RSS 2.0 feed. You can skip to the end and leave a response. Pinging is currently not allowed. grazi: Thank you so much for visiting and for the lovely comments! 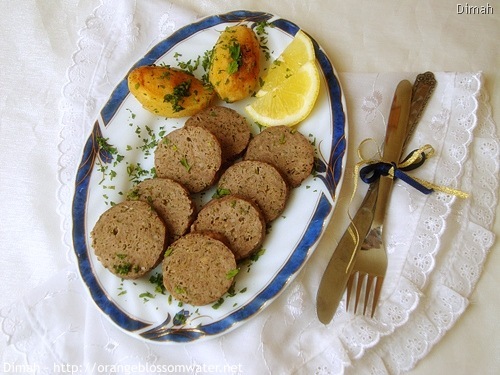 My aunt used to make a similar dish and I haven’t had it in years! Looks so good with these potatoes! 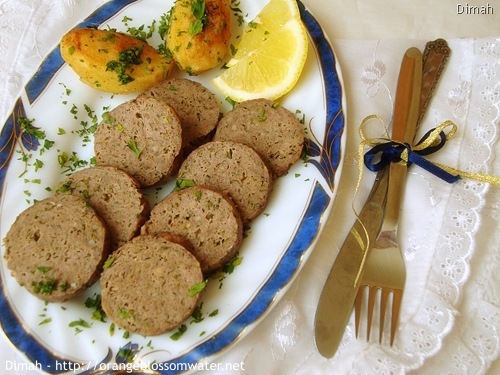 The origin of this dish is the French ”galantine”. I just discovered your blog but the way. Good job! I love all your Syrian recipes I had never heard of before. I’m learning so many things about the cuisine of your region of the world I love so much! Thank you so much Michaël for stopping by and for your valuable comment. 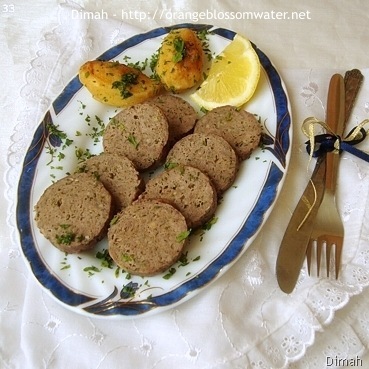 My mom learnt this recipe at school in Syria when she was 13 years old, I wrote the name according to her pronunciation. 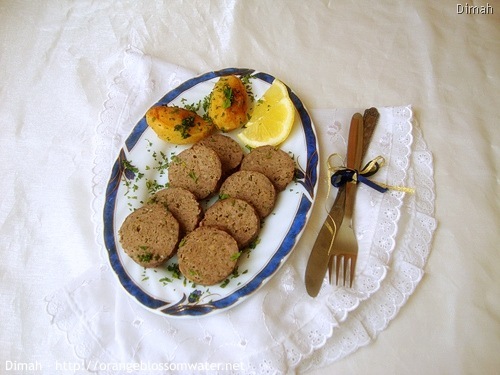 Thanks for letting me know that you enjoy the blog and learning more about Syrian Cuisine, appreciate it.